Ten years ago the Observer Ethical Awards launched with the vague notion that a lot of good people were doing brilliant things to bring environmental and social justice to the UK and that should be celebrated. There was also a hunch that this was where the real change would come from – as opposed to waiting for government. A decade later these awards (sometimes gratifyingly called ‘the green oscars’) are rooted firmly in the annual events calendar and attract thousands of entries. By nominating and voting in this year’s awards, you can help to boost more ethical warriors. 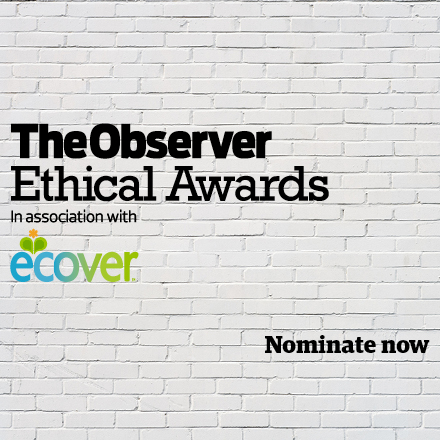 The Observer are looking for unsung green heroes (often working away quietly and modestly for many years), to designers who can redefine ethical fashion through a piece for queen of the green carpet, Livia Firth to a new crop of Young Green Champions. For the first time, they join up with Bafta to find the greenest television or film production of the year. Let’s make this year a record breaker, please nominate and vote as never before and make this a tenth birthday to remember!